This time our Masked Installer gives us his candid take on how the iPhone (and iPod Touch) is shaping the way his clients control their professional custom installed smart home systems and how it really could be the device that changes people’s perception of Home Automation. “When I posted my heroes and villains of last year I had iTunes in the villains’ camp. I didn’t like the DRM, the inadequate bit rate and the non-standard method of dealing with cover art. I’m still not a great fan of iTunes but I do have more than a sneaking regard for Apple’s other products. If I was doing another Heroes and Villains piece I’d have the iPhone in there on the side of the good guys. I think it’s the most capable all round piece of hardware I’ve ever used, more importantly I think it’s the device that’s most likely to change people’s perceptions of what home automation could do and how it should work. To put that in perspective I’ll do a comparison of what my iPhone does vs. a wireless AMX touchpanel. They’re very different devices but because they’re multifunctional personal touch screens there’s a lot of crossover. The AMX panel is a better home automation device. We run whole houses on these things with a single integrated interface for audio/video, heating, security, lighting, blinds, gates, CCTV etc. Because we design the GUIs we can tailor the interface to our clients’ needs and because we have some talented programmers we can pretty well control anything using the Netlinx programming language. The touchpanels talk to an AMX processor usually tucked away in the rack and the processor has an array of comms onboard – IP, RS232 , IR, Relays, Digital I/O. That’s a pretty potent combination and it comes at a price. The panel is over £3k, the processors vary but the one we use most often is around £2k and when you get any of this kit out of the box it doesn’t do anything – just about all of the functionality requires custom code – so there’s programming fees as well. That said the end result is a solid, well supported install with remote management capability and an interface that is absolutely tailored to the customer’s requirements. My iPhone cost nothing with the package I chose. That package has proved to be £30 a month less I was paying to Orange for using my gruesome N95. Out of the box you get a phone (sorry I know that’s pretty obvious), email, SMS and a really usable browser. AMX for all its capability is a long way behind when it comes to comms. The new panels have VoIP capability, there’s a SIP gateway so it’s possible to use them as phone devices and I’ve seen email and RSS readers implemented (though it’s not something we do) but there’s no browser. As an information device, an AMX panel lacks a lot of what the iPhone can do. Shouldn’t be too surprising though, the iPhone is a communications platform. What is more surprising is how much wider the iPhone’s capabilities become when you throw in wealth of stuff the Apps Store. The first thing I put on mine was Remote – the Apple application that offers you control over iTunes or an Apple TV. As a taster of what’s possible it’s a great introduction. I’ve never really got the whole AirTunes / Airport Express thing; without some form of smart remote interface, there’s still the need for a PC or Mac to control what’s going out. Remote fills that gap and gives you a pretty full featured interface for iTunes control. It’s not a true multiroom audio solution in terms of selecting output zones, managing volume and all the things that make dedicated multiroom solutions work well but its media selection interface is just lovely – in some ways better than the iPod Touch’s own interface. Remote was something I played around with for a bit and then left alone. It’s free, it’s fun and it makes remote iTunes management an option but I wasn’t going to use it at home. Zones had me changing stuff around on my home setup to accommodate it. Zones is an iPhone / iPod Touch app for Sonos control and I’ve got a fair chunk of Sonos kit. If you’ve got a Sonos Zone Player then it’s worth the £9 or so it costs. It doesn’t have the same multizone volume control of a Sonos CR100 controller and it’s not got Zone synching so like Remote it feels like more of a point to point solution. The difference for me is that it offers a new interface on top of the Sonos hardware. Sonos is a dedicated multiroom audio solution, Zones gives you a new way to access a lot of what Sonos does really well. So searching with Zones is much nicer than hunting for stuff with a CR100, browsing your lists of Albums, Artists and Genres is more fun than browsing with a CR100. I’ve always loved Sonos but the iPhone form factor and touchscreen’s multitouch capability makes the CR100 feel really dated. The great thing here is that you’re just adding a new fun way of enjoying a Sonos system, nothing gets junked. If I look at the other multiroom systems we sell then there is similar activity. Speakercraft have developed a custom web interface for the iPhone. Not being a native client it doesn’t make maximum use of the iPhone’s capability but it’s simple to integrate, it works and again it’s an additional way of enjoying an existing system. I’d describe it as an addition to a well set up Speakercraft system and worth looking at if you’ve gone down that route. What all of these applications lack that AMX has in spades is the totally integrated interface. With one of our AMX panels you get an interface that gives you all of the control you need, not just the ones relevant to a particular application. Our cinema interfaces offer control over lighting levels, heating levels, source selection and control, fine tune over video processors and AV amps. However, there’s a shortcut route to integrating an iPhone or iPod Touch here as well. All AMX 4th Generation (G4) panels offer VNC. Jaadu (formerly known as Teleporter) is a brilliant VNC client for the iPhone. A widescreen AMX panel has a resolution of 800 x 480 pixels, Jaadu makes a pretty good fist of scaling that down to the iPhone’s screen. Again, this isn’t a replacement for AMX – in this context you need an AMX panel to VNC into. What it is a nice additional way of controlling a wider control system with a device that you’re likely to have in your pocket. On a local network, it’s very usable. On a WAN you need a bit of patience but it gives me an acceptable way to remotely manage sites including our own showrooms. 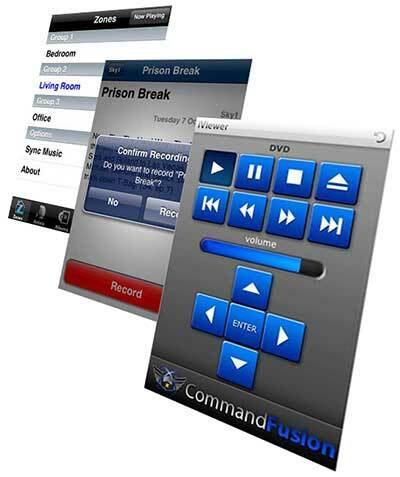 The next step from that has to be native applications – there are a number appearing now and among them is the Command Fusion iViewer application for which a team of AMX developers are developing an AMX module. Native apps offer the possibility of a higher level of integration and the use of the platform’s hardware capability. Tying an iPhone interface to AMX code running on an AMX processor is very appealing and offers us the potential to create great user interfaces to our own code base. I think the key to great control interfaces has to be simplicity and providing we don’t ignore that we can supplement our installs with a handy pocket size device that so many of our customers carry. Simplicity is the key to the best iPhone apps. Some personal faves. Trains is a UK app that lets you check departure times by Station. TV Plus is a fantastic client for Sky’s Remote Record. Newsstand is a fun RSS reader that makes great use of the multitouch features of the iPhone. Touch Term is a great SSH client for remote management and the last.fm client is a nice way of extending your iPhone’s library when you’re in Wi-Fi range. So have I gone completely insane? Am I putting forward the view that the top end players like Crestron and AMX are under threat from a phone or an iPod? Not exactly, I still hold that an AMX setup is a vastly superior home automation platform – it’s what it’s designed to do. The iPhone in comparison can be viewed as a crude mish-mash of unrelated applications, but some of those applications really make you think about how touchscreen interfaces should work. The defining moment for me was when I was when I flicked my finger down a list of artists on a wall mounted touch panel and stood there waiting for something to happen. 2 Comments on "The Masked Installer – the iPhone in the Smart Home"
I’ve spent a night – sad – playing with this combo. The iPhone app is great and it redefines my view of how Sonos should be controlled. But the big stuff is in what is being controlled. It’s got Last.fm which instantly promotes it as a hardware platform. And Sonos Radio is just awesome….when you find your way through the menus. I swear, there are BBC podcasts in there and I’ve listened to them but I’m not going to post instructions of how to get to them. I do this stuff for a living and I found it bloody difficult. My challenge is this. Someone post a SHORT guide on how to get to last weeks Fighting Talk.